Well, it's pretty clear that this I LOVE NY trio of Bond no 9 launches is geared toward the tourist customer and may well be found at the same kiosks purveying miniature renditions of the Statue of Liberty, etc. So I do believe that this is one of the more diaphanous gimmicks on the part of this house to remain solvent during these very difficult economic times, when a lot of people are out of work and obviously not buying luxury items such as niche perfume. Although some may be put off by the gimmickry of this house, I have to confess that I find it rather endearing. They really are trying to survive, and I admire that. To be perfectly frank (quoi d'autre? ), I have never really understood the antipathy that some perfumistas harbor for this house. Yes, they're gimmicky; yes, the MSRP of their perfumes is high. But how do those factors distinguish them from countless other houses? I ask most sincerely. My recent experiences with some of the not-so-catholic [sic] elements of the perfume community lead me to suspect, albeit vaguely, that some who rail against this house may despise the Chair for no other reason than that she is a she, who likely conducts herself in the manner of he-Chairs (her firm still exists, after all, eight years later), but is judged by a different set of standards altogether. In any case, whatever the deeper reasons for this trend may be, it seems absurd to despise this house because of their gimmickry. Which house is devoid of the same? I reiteratively inquire. Gimmickry, my fellow fragrant friends, is the essence of marketing! So I say: rise above the kitsch and the glitz, and give these perfumes a fair sniff! I LOVE NY FOR HEROkay, it's true, I cannot tell a lie: given the context of this launch (for which Bond no 9 has even lowered the prices! 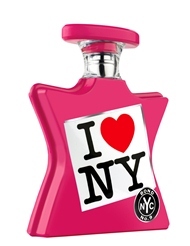 ), I had somewhat low expectations for these perfumes, and I am happy to report that in the case of I LOVE NY FOR HER, they have been vastly exceeded. This composition is, as advertised, a pastry gourmand with a hefty dose of patchouli and a few flowers thrown in as a garnish. I have to confess that the “blueberry muffin” note sounded vaguely repulsive to me, but this perfume is not at all, although, to my great surprise, it does indeed smell very much like a blueberry muffin during the opening minutes! I LOVE NY FOR HER fits right in with the rampant sweet patchouli fad, but this particular version dries down to a nice, lightly spicy pie crust-like layer with serious wrist-sniffing potential. Definitely worth trying, if you're into gourmand perfumes. According to my manufacturer's card, this composition contains geranium, and I do believe that such a note would account for the dominant geranium-like scent. Married with coffee and patchouli, in addition to cocoa and vanilla, this smells quite scrumptious and compelling to my nose. I would love to have a bottle, to my great surprise. 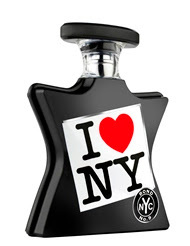 I may be one of the only people to purchase I LOVE NY FOR ALL not because of but in spite of the bottle. I do “not” love New York, and I might even hate New York, but it's probably not safe to say such a thing these days. It sounds so unpatriotic that I might be branded as a terrorist suspect. And, as we all know, this government equates suspects and terrorists, so I could quite easily end up on the Predator drone “capture or kill and preferably the latter” list... So let's just leave it at I do *not* love New York. The good news is: the I LOVE NY logo on these bottles is a peel-off sticker, which means that once they have been removed, they will look very, very sleek! I recall having been disappointed to discover that many of the Bond no 9 bottles are decorated with peel-off labels rather than being printed directly on the glass surface (as is the case with my bottle of Chinatown, happily). But here, what I would ordinarily regard as a design flaw proves to make it possible to improve the final design presentation--demonstrating, once again, that a glass half empty really is half full! This is a good example of the truism that some fragrances really do smell more appropriate on men than on women. Certainly what we have here is a familiar, if not hackneyed, theme: an aromatic woody cologne with a big dose of cedarishness (iso-E-super?) and the typical complement of notes characteristic of masculine colognes. Nothing about this smells new or interesting to me. I LOVE NY FOR HIM is definitely my least favorite of the trio, but it might make a good choice for a guy who just wants a generic cologne in a keepsake bottle. Someone who would leave the label on. FOR HIM salient notes (from http://www.bondno9.com/): ginger, juniper berry, grapefruit zest, lavender, geranium, patchouli, leather, sandalwood, labdanum, musk and amber.